More than 5,500 students and teachers attend nationwide STEM conference complete with competitions, break-out sessions and industry representatives. 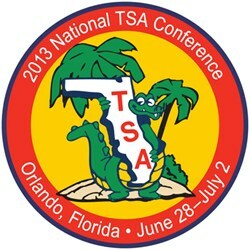 The Technology Student Association (TSA) hosted its largest-ever annual national conference June 28 – July 2 at the Rosen Shingle Creek Resort in Orlando, Florida. More than 3,000 middle and high school student members competed in more than 60 competitive events based on STEM (science, technology, engineering and mathematics) principles and concepts learned through projects during the school year. The conference celebrated the contributions of advancing technology in our society and TSA’s 35th anniversary with the theme "A Tradition of Excellence." Middle and high school technology students, guided by their chapter advisors (teachers), competed with their peers in STEM events such as Agriculture and Biotechnology, CAD, Construction Renovation, Video Game Design, Dragster Design, Engineering Design, Flight Endurance, Music Production and Structural Engineering. Click here to view the event finalists. More than 100 teams participated in the TSA VEX Sack Attack competition, an exciting, head-to-head robotics contest. Click here to view the finalists. Many attendees participated in break-out sessions, designed to develop and enhance leadership skills through customized sessions based on The Student Leadership Challenge – The Five Practices for Exemplary Leaders by James M. Kouzes and Barry Z. Posner. Other special interest sessions were presented by industry representatives and educators. The first of four general sessions featured a keynote address by Steve Barbato, Executive Director/CEO for the International Technology and Engineering Educators Association (ITEEA). TSA’s national service project partner, The American Cancer Society (ACS), recognized conference attendees for their ACS and Relay for Life fundraising efforts throughout the year. TSA’s Tests of Engineering Aptitude, Mathematics and Science (TEAMS) program held its inaugural national competition in Orlando. More than 30 student teams competed collaboratively in teams of four to eight individuals in an on-site oral and problem-solving event to address real-world engineering challenges. The theme for 2013 was "Engineering a Secure Cyberspace." Click here to view the finalists. TSA partnered with the Verizon Foundation and administered the 2013 Verizon Innovative App Challenge. For the Challenge, teams of students developed mobile applications that addressed a problem in their communities or schools. The top 10 winning teams from across the nation presented their mobile apps at the national TSA conference. Winning teams received cash to support their school’s STEM program, individual prizes and support to bring their app to the marketplace via Google Play. The Meet and Greet event held on Sunday, June 30, included educators and industry representatives from more than 20 organizations including ITEEA, the National Science Teachers Association, the Florida Solar Energy Center, Whitebox Learning, the Nuclear Energy Institute, CNC Software and Colorado State University. Conference attendees also had the opportunity to meet the national officer candidates at their campaign tables. For more information, visit the Technology Student Association homepage at http://www.tsaweb.org or contact Lynda Haitz, lhaitz(at)tsaweb(dot)org.